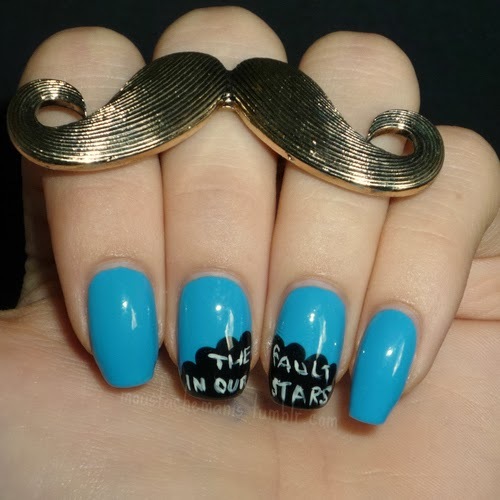 The Fault in Our Stars hits theatres ... and your nails! I only recently read The Fault in Our Stars by John Green (courtesy of a much-loved copy of the daughter) ... and felt like: why wasn't John Green part of my teenage years? This book is definitely stellar young adult literature, and with the following it has, of course it's becoming a movie! John Green recently leaked 12 seconds of the movie which excited fans no end. Then of course, the trailer came out. More craziness! 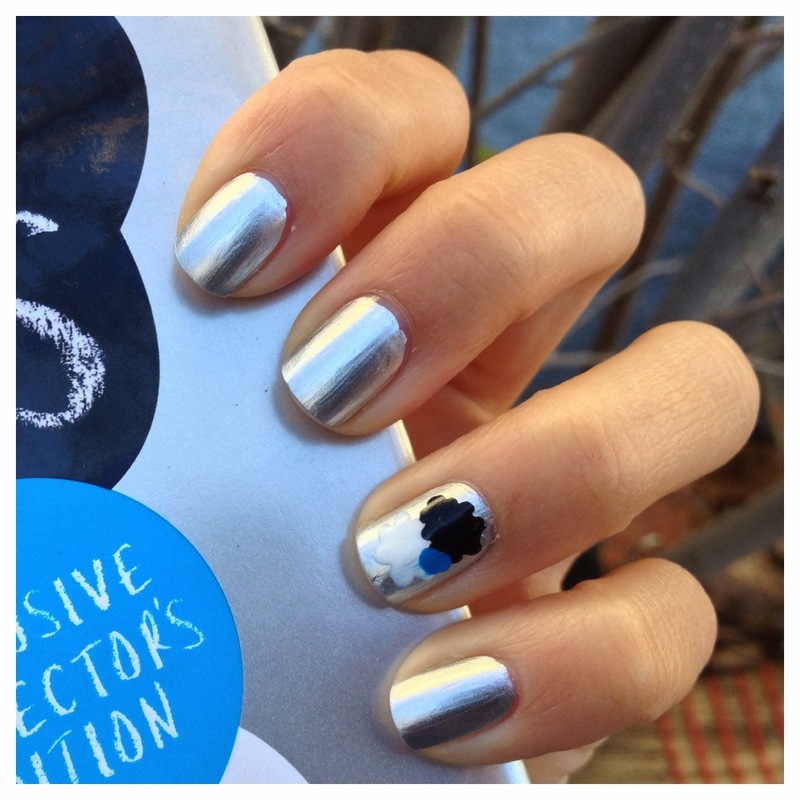 I loved the book, am ambivalent about the movie, but am quite impressed by the fangirling nail art below! What about you? Have you read this? What are your feelings about the movie? Celine Does Nails picks out some key things from the book. The "Okay" is cute but the lungs sort of freak me out. A more subtle take on the cover by Moustache Manis. 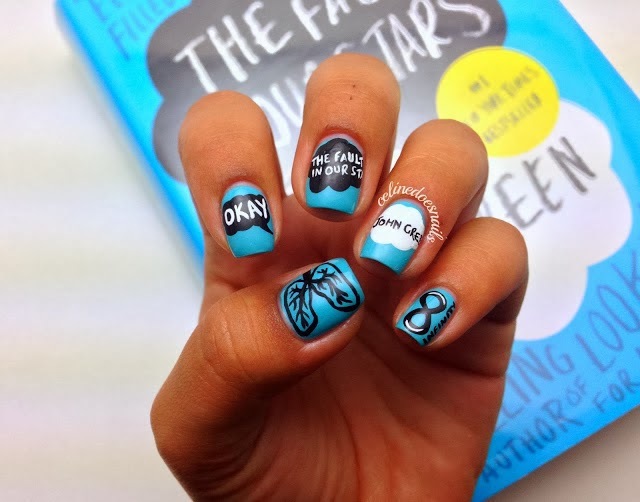 Warm French Onion Soup's nail art is very wearable and just a little bit cryptic ... it's like code to fellow TFiOS fans! Warm French Onion Soup .... this time with her first year anniversary edition in platinum! I love the nails. All so fun. I'm always amazed at nail art, so much work for something so ephemeral. All you need is a secret nail flash ;) Snap a few if you end up doing any of these! AHHH the TRAILER made me cry! THE TRAILER! Oh gosh, when I see the actual film I will be makeup free for sure. I do like those nails, but I think the nicest ones are the slightly more subtle ones - with just the clouds on. And the lungs... yeah =/ Weird. OMG, your nails are so cool! The movie will be released in Malaysia this Thursday. Can't wait to watch it especially since I miss Amsterdam!